Captique™ is a skin filler treatment used to rapidly add volume beneath the surface of the skin and improve the appearance of fine lines and wrinkles. Captique treatments are quick and safe. You can receive Captique during your lunch hour. Unlike other injected gel products, Captique is associated with very minimal, if any, swelling. Captique™ is an injected gel made from a safe natural product, hyaluronic acid. It is injected using a very fine needle that does not leave a scar or other blemishes on the face. Captique is specially formulated to have a lower potential for inflammation. This means that you can expect minimal swelling, if any, immediately following your treatment. Unlike other types of injected treatments, if swelling does occur, it usually goes away within just a few hours. Captique is also associated with less redness, itching, bruising, and pain. Captique is especially suited for fine lines located around the mouth, including wrinkles at the edge of the lips, fine lines above the lips, and smile lines. The hyaluronic acid in Captique gel attracts water which maintains volume underneath your skin. 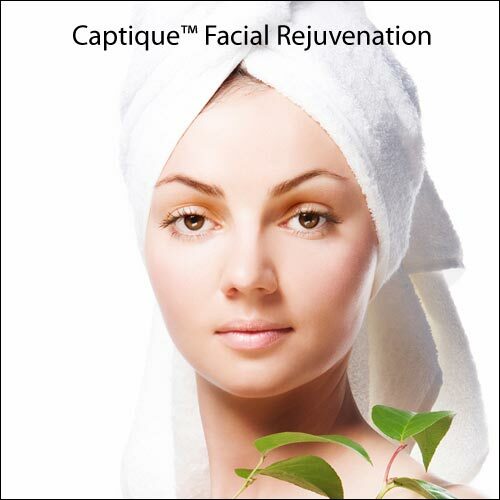 Captique adds volume and temporarily creates smoother more youthful looking skin. You will have a consultation prior to your Captique treatment. Your doctor will examine your skin and listen to your concerns and expectations. Together, you will formulate an individualized treatment plan to attain the results you desire. You can receive Captique treatments conveniently in your doctor’s office. There is no need to wait for a skin test. The treatment is quick and easy. Most treatments last less than 30 minutes—you can have healthier looking skin over your lunch hour. Captique injections use a very fine needle and cause minimal discomfort. You can expect minimal, if any, after effects from your treatment which may include minor bruising. If you do experience swelling, it should go away within just a few hours. Captique produces long-lasting but temporary results. Periodic touch-ups may be recommended. Additionally, Captique may be used in conjunction with other treatments to produce the specific result that you desire.